Venerable Pannavati Bhikkhuni is Co-founder and Spiritual Director of Heartwood Refuge in Hendersonville, NC, a multi-lineage retreat center and intentional spiritual community; and Co-Abbot of Embracing Simplicity Hermitage, a 21st century trans-lineage Buddhist Order. 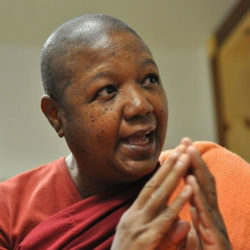 Ordained in Theravada and Mahayana traditions and a recipient of numerous international humanitarian awards, she is both contemplative and engaged in compassionate action, world-wide. Pannavati currently serves the Global Buddhist Bhikkhuni Association, as a VP for the United States.